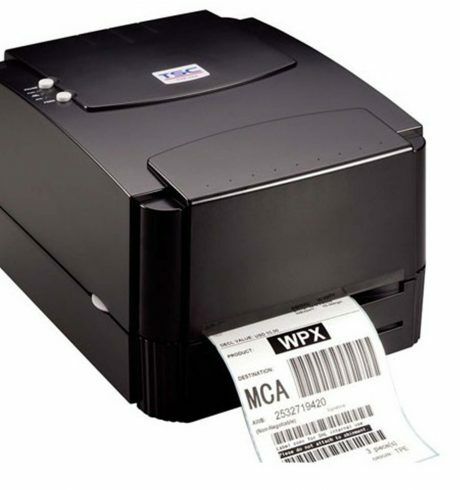 With its thermal transfer printer, the TTP-244 Plus, TSC packs high quality printer features into robust housing at an attractive market-entry price tag. Thanks to its standard integrated EPL and ZPL emulation, this desktop label printer is easily compatible with most ERP systems, and can be integrated into any environment out of the box. For this there is one USB and one RS232 interface available. Optionally, you expand the networking capability of the TTP-244 Plus with optional Bluetooth or an external 802.11 b/g/n Wi-Fi port. The TTP-244 Plus is equipped with a powerful dual motor. With a print speed of 102 mm/sec. it impresses in a variety of applications, such as the labeling of products and shelves, in shipping and goods receipt, as well as in inventory and document tracking in companies and healthcare facilities. Use 300 meter thermal ribbons to reduce the number of maintenance-related interruptions, and increase efficiency. With the optional external roll holder even implement the usage of correspondingly large label rolls.